Our easy-to-use, feature rich management system allows schools to make sense of their data and see what’s really going on. From attendance and assessments to accidents and incidents, ScholarPack helps schools record, manage and review everything that’s going on. And the result? All round smarter schools. The same reasons 350 schools switched last year. ScholarPack is easy-to-use, keeps your data safe and secure and will have you census-ready from day 1. Just some of the reasons over 350 schools made the move. In fact, more schools switched to ScholarPack last year than to all the other systems combined. It's easy, secure, and a whole lot more. Our system is so intuitive and easy-to-use, 99% of users feel fully confident after just 1 training day. Plus, we use feedback directly from schools to keep making it easier. What more could you want? This is where we really stand out. Our UK Support Desk genuinely enjoy taking your calls and fixing your issues. We fix them really quickly too, with 9/10 issues resolved in just 10 minutes. We take your data security seriously. Not only is your data backed up 3 times a day, but we also use the latest encryption technology to keep it for your school’s eyes only. We also include tools to help make you GDPR compliant, right out of the box. Here’s a bombshell for you: For academies, ScholarPack is up to 55% cheaper than SIMS. Let that sink in. But cheaper doesn’t mean we skimp on your package. Our core system contains lots more modules as standard that most other providers charge extra for. The trends don’t lie. Over 350 schools switched to ScholarPack last year. That’s more than to all the other systems put together. And we keep our existing schools happy too - we’ve got a market leading 99% retention rate. 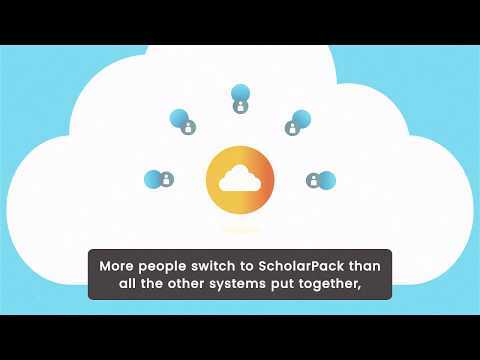 Switching to ScholarPack is super simple. So simple, we guarantee to have you census-ready on day 1 and fully migrated on day 14. We’ve been so impressed with ScholarPack. Having only ever used SIMS before we were a bit nervous about switching, but we’ve been over the moon with how easy ScholarPack is to use. ScholarPack is up and running in some of the UK’s leading MATs. With feedback from these trusts, we’ve put together a range of features that make our software perfect for groups of schools.